THEN Tarzian will put 22% of spending towards energy improvements. Be there. 22 cents on every dollar made that day goes to energy efficiency improvements throughout the store! 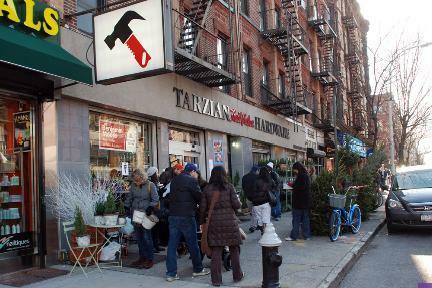 Carrotmob NYC will hold a reverse boycott at Tarzian Hardware, 193 7th Ave SUNDAY, DECEMBER 14 from 12 - 3. The group will bring hundreds of shoppers to this family-owned hardware store. Carrotmob shoppers are expected to spend thousands and Tarzian has agreed to put 22% of the day's profits towards energy improvements such as upgraded lighting, heating, etc. The beautiful, green people of Brooklyn showed up in force and spent over $12,000! The hardware store raised enough money to do a store-wide energy retrofit.